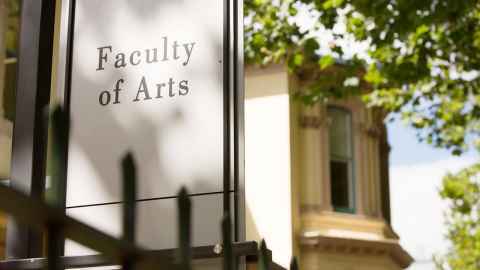 The Faculty of Arts has been at the heart of the University of Auckland for over 125 years. Auckland University College was established in 1883, as a part of the University of New Zealand. In those days, if you graduated with a degree, it was most likely a Bachelor of Arts. As the College grew in the early twentieth century, a new Arts Building was erected on Princes Street — the first permanent building to be designed and built for use by Auckland University College. We've outgrown it since then, but the building that A.R.D. Fairburn worried would frighten old ladies in the park is now known as the ClockTower — the University of Auckland's most iconic building. At the heart of the Faculty of Arts in the twenty-first century are our internationally respected researchers, who contribute to worldwide discussions from our unique standpoint in Aotearoa New Zealand. Arts graduates are sought after by employers right across the economy for their ability to think critically, question effectively, and deal with complexity, difference, uncertainty and unpredictability. Students have been graduating with a BA from the University of Auckland for over 125 years now, and heading out into the world equipped with these skills. It's not just about the economy though. Here in the Faculty of Arts we research, teach, learn and reflect widely and deeply — for the sake of society, citizenship, and creative, engaged and empowered graduates. In a world of information and data, we look at what it all means. Philippa Boyens ended up co-writing screenplays with Peter Jackson, Helen Clark became Administrator of the United Nations Development Programme, Andy Lark was Chief Marketing Officer at Xero, Jonathan Hunt was New Zealand’s High Commissioner to the United Kingdom, Claudia Orange is the head of research at Te Papa, and Don McGlashan is one of New Zealand's most celebrated song-writers. They all studied with us. Just as it was when Kate Edger graduated with a BA from the University of New Zealand in 1877 — becoming the first woman in New Zealand to gain a university degree — an Arts degree is the ideal qualification for a changing future. The Faculty of Arts is where you go to get one.